Words by Kevin Doocey on May 18, 2012 . As would expect, a lot of Blackburn Rovers players are interesting clubs in the Premier League following their relegation to the nPower Championship. 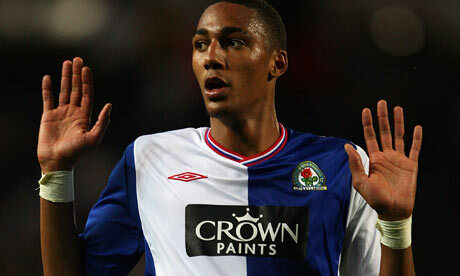 Junior Hoilett, Mauro Formica, Yakubu, and now Steven N’Zonzi are all thought to be leaving Ewood Park this summer. N’Zonzi is now, apparently, a target for Alan Pardew and Newcastle United. By trade, N’Zonzi a defensive midfielder so he would probably provide back-up to Cheik Tioté when he suffers inevitable suspensions next season , or indeed provide cover for the Ivorian when the Europa League kicks off. As we know, NUFC are already working steam ahead on the transfer front and are expected to announce a couple of signings very soon. I’ve managed to watch N’Zonzi a little bit this season, and he is quite a solid player. He’s young, strong, and possesses a fairly decent strike as well. At 23 years of age, and with Blackburn Rovers in a perilous situation - they’ll be eager to sell and raise funds. The likes of Hoilett, and even Morten Gamst Pedersen will have no problem finding a club in the Premier League so there might be a bit of value to be had with everything considered. SkySports are running the story that we, alongside seven other clubs are in contact with N’Zonzi’s representative. Sunderland happen to be one of those clubs too, as well as Spurs (no surprise), Arsenal, Chelsea, Liverpool and Everton. If one Chelsea or Spurs come calling he’ll probably make the move to London, but I’m 100% sure Alan Pardew has N’Zonzi slightly down his wish-list - with the Frenchman a possible Plan B or C.
I’d be favour in signing him up, but he’ll want first team football - something yet again, we can’t provide with a fully fit squad. However, unlike Everton, Sunderland, and Fulham, we can offer him a place in a team competing in Europe next season where he would most certainly merit playing time; tempting enough I would think? Id snap you hand off for him, he looks a great player, gets you more goals than tiote i believe aswell! You really don't have much of a clue about blackburn rovers, Nzonzi is young and strong but his striking of the ball couldn't be much worse. People remember a goal he scored against everton which was one in a million of his attempts from that distance. However he does have great potential and will not be providing BACK UP for anyone next year. Pedersen would be lucky to get into any other side in the top 3 english divisions, decent left foot which of late has deserted him and he has zero else going for him, slowest player in the football league. If we lost pedersen on a free I would have a party, he's worse than jason roberts!! About time this idea of him being one of our better players disappeared, we have been applauding his removal from games for a full season, people don't seem to have picked up on this yet.